Canary Wharf isn’t exactly one of the capital’s go-to gastronomic destinations. Amidst the sterile steel and glass sky-scrapers, it’s often difficult to find anything remotely interesting food-wise. Hence, whenever I find myself in the area, I end up settling for a fail-safe meal at one of the high-street’s more reliable commercialised suspects (Wahaca or Carluccios usually). Believe it or not though, I think I’ve finally found a restaurant I’d happily make the trek to Canary Wharf for just for a meal. Sister restaurant to the Knightsbridge-based Zuma, Roka’s Canary Wharf outpost has been open for almost 2 years now, following in the footsteps of it’s much-acclaimed Charlotte Street branch. If it weren’t for the DLR being unexpectedly down for planned engineering works on previous evenings when I had intended on going, I would have actually gotten round to eating here much sooner. 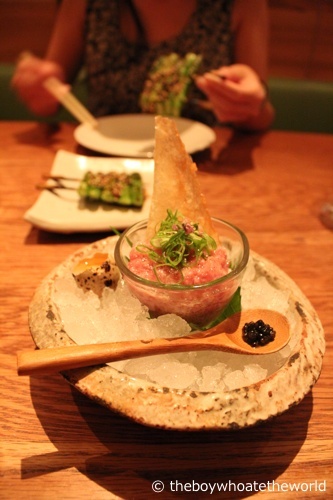 The menu at Roka is wide-ranging, covering everything from sashimi to sushi to tempura – all executed with precision and contemporary flair like the delectable Tuna tartare, Quail’s egg and Caviar starter we opened our meal with. 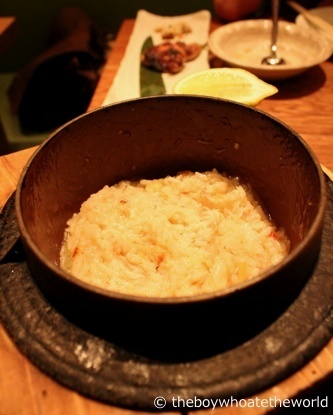 However, it’s the dishes coming hot off their primitive Robata Charcoal Grill that really define this franchise. 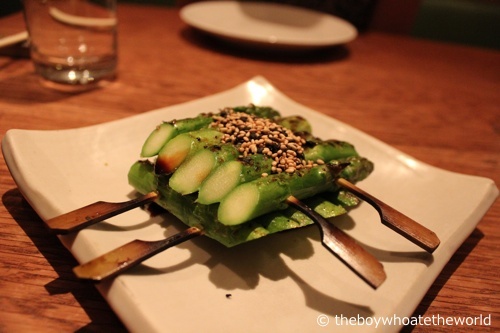 Even plain-jane Asparagus gets elevated to that next level when cooked on their Robata grill. Wonderfully sweet, charred and tender on the outside with a slight crunch of a bite still left in the middle, it’s simple, but oh so sublime. The same goes for their seafood and poultry dishes. 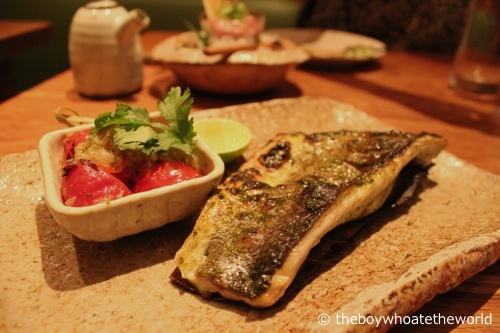 Seabass with yuzu-spiked Cherry tomatoes and Sake-flavoured Quail with smoked eggplant were both char-grilled to crispy perfection on the outside, yet still wonderfully tender and moist on the inside. A food purist’s dream. The star dish of the evening for us though had to be the Zuma Sweet-Chilli Beef fillet. Cooked to a beautiful, melt-in-the-mouth medium rare, the steak simply melted in the mouth like butter, releasing canivourous explosions of beefy flavour accompanied by a subtle background sweet heat from the chilli teriyaki-style marinade. Capital-T-tender and absolutely dee-licious. 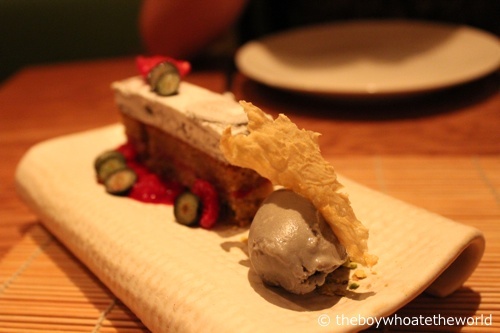 Desserts don’t often get a mention at Jap restaurants. But take a look at this B-E-A-you-TEE of dessert below. The brainchild of Zuma pastry chef Julien Philippe, its a wonderful creation of air-light marshmallow, fluffy Pistachio sponge, savoury-sweet black sesame ice-cream and tangy raspberry coulis. What more does one need? A grand end to a grand meal. The bad news? 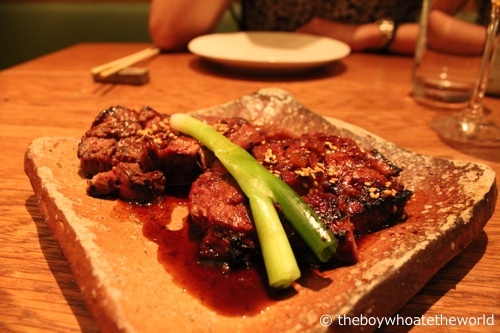 Dining at Roka is by no means cheap. Damage including a glass of plum-wine and bottle of Asahi black came up to just under £60 a head. Yes, its a bit of a wallet bashing for arguably ‘simple’ food at a non-Michelin starred restaurant. But it’s the elegant simplicity of the experience and the Robatayaki cuisine that makes it worth every penny if you ask me. If it weren’t for my hyper-sensitive fire-alarm, I would get myself a Robata grill for my kitchen in a heartbeat.